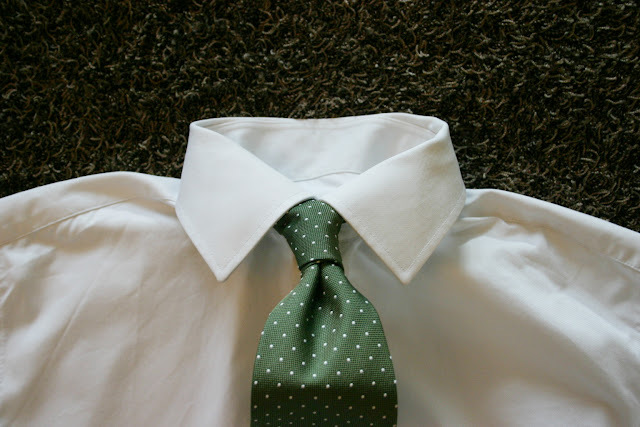 Now, I personally think the way you tie your neck tie and how you form the know is a big portion of the end result. Otherwise impeccable outfit can go down by at least by a half if the knot is all wrong and, say, the tie hasn't been tightened properly. I have to admit I'm a bit obsessed by tie knots, and here's some thoughts I've developed lately. In my opinion this is the most important post I've written so far. First and utmost, Windsor and half Windsor both make me sick. Very rarely do they work, and mostly when the person wearing them is quite wide and big. 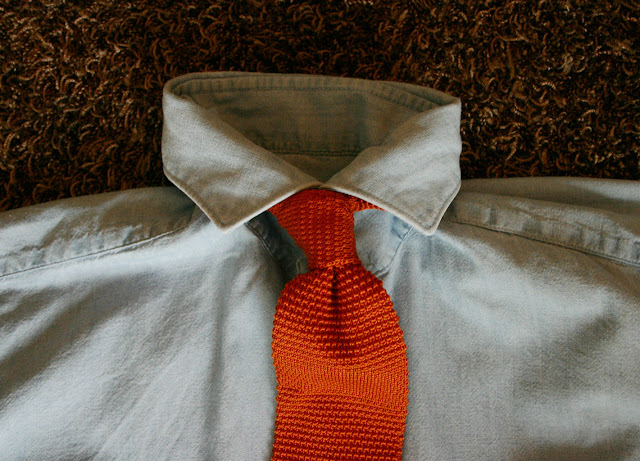 Then I can see a medium sized Windsor knot working as it sort of works with the overal habitus. However, in 98% of all cases a four in hand is always more beautiful. So, what about four in hand? I personally think it's form is better in line with the human shape, and furthermore the unique shape makes it so much more interesting. 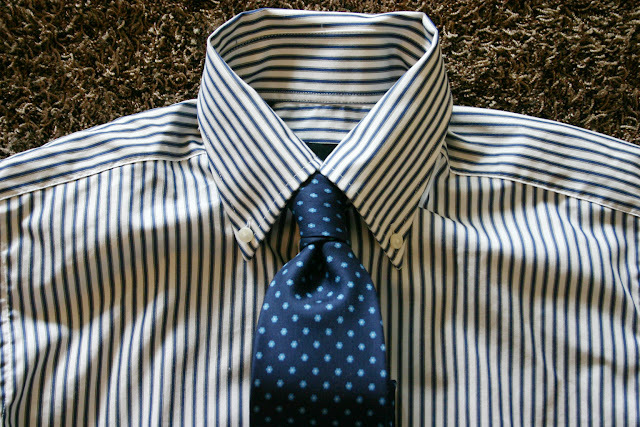 Now, most people aim for the perfect dimple that's created to the center of the tie. I often do this myself, and here are a few examples of regular Four In Hands as well as double Four in Hands (which I usually tie). 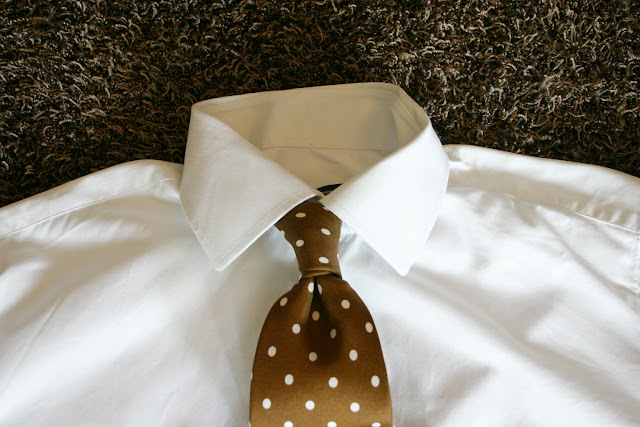 Now, for work and especially for more formal occasions I do favor this way of hanging myself, but lately I'va started to grow a liking to a more informal and nonchalant way to present my tie. After some thinking I've made the following observation: For me the beauty in a four in hand is in the shape of the knot and even more in the sort of squeezing effect is has to the blade of the tie. This is a bit hard to explain, but the point is I no longer favor a single dimple as my to-go kind of four in hand. I actually think the aesthetic just comes from the uniqueness of that day's knot, be it a bit off in some way or even better also correlate with the way you've folded your pocket square. Here is a few examples of four in hands I just tied without any sort of goal. 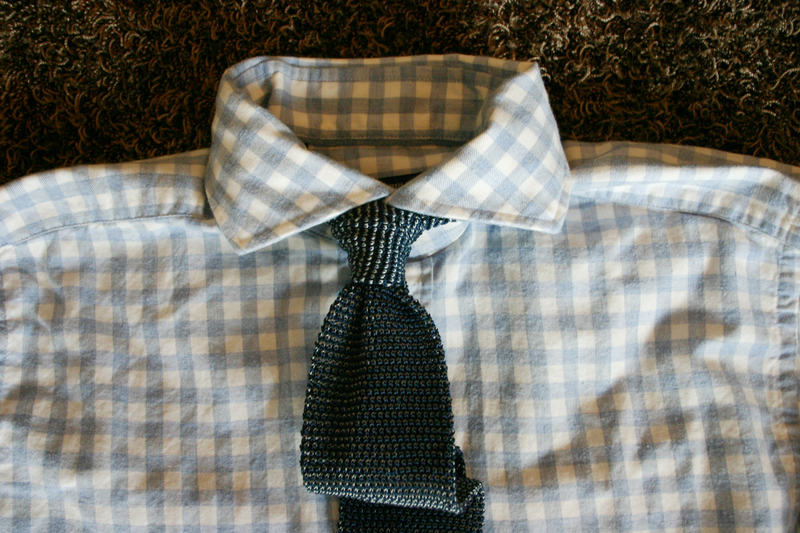 Tie by Berg & Berg. I'd be very interested in hearing what you think, as I haven't really discussed this with anyone and it is basically a thing that has been brewing in the style section of my head for some time. Dimple or just random form? I would just like to compliment you on your ties. I especially like the green pin-dot tie by Berg & Berg int the last photo. 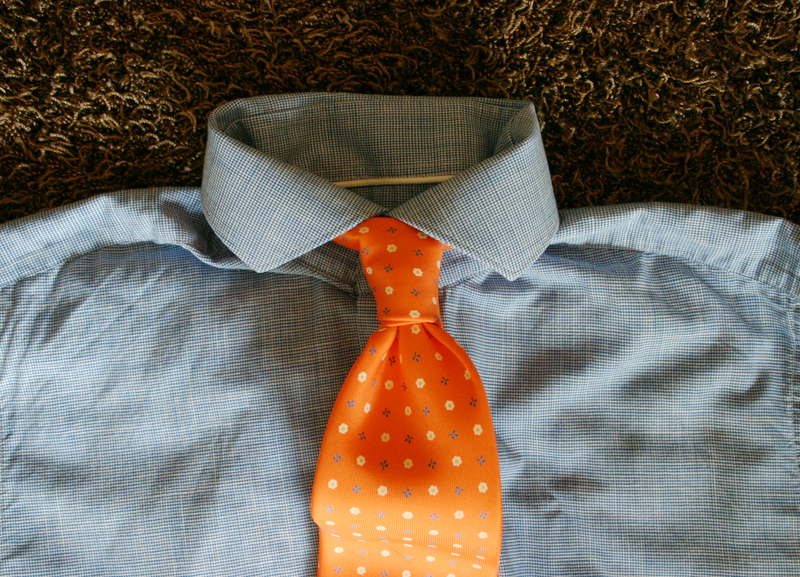 When wearing a tie, I think a random form knot looks great on attire that is more casual because it is less formal than a dimple in the knot of the tie. However, if you are wanting to cause a little more interest (or contradiction), then a dimple in the knot of the tie would work as well. I prefer the former when wearing a tie with more casual clothing. 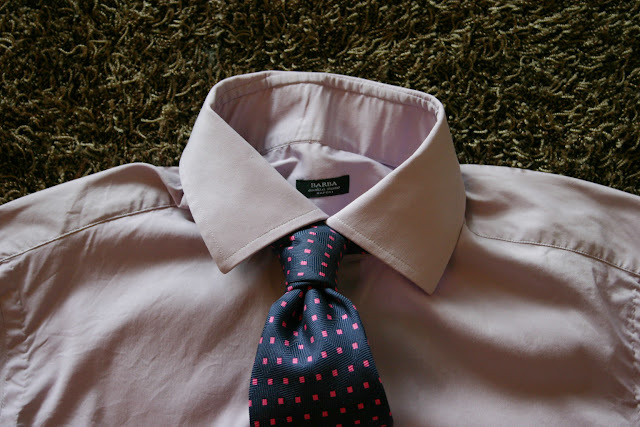 A dimple in the knot of the tie, when wearing more formal clothing is essential and brings a level of sophistication that a more casual preference would miss all together. 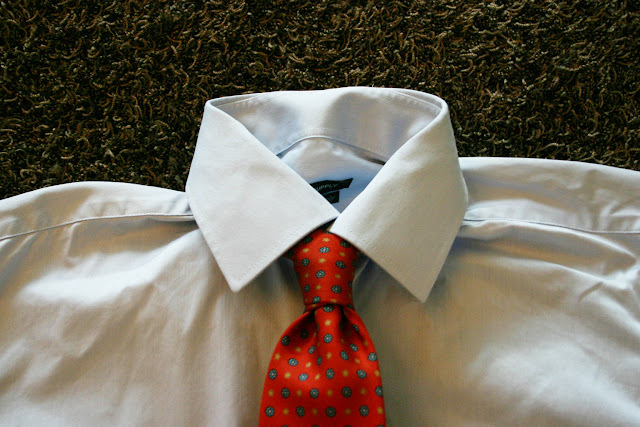 I notice that some of your shirts are spread collar. Have you considered a Full-Windsor or Half-Windsor knot with this collar style? Thank you very much, and I agree it is a handsome tie. 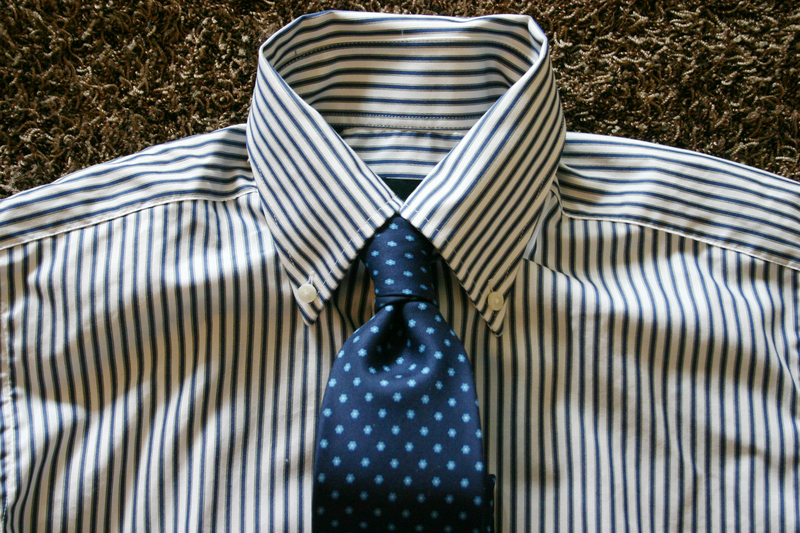 It isn't the easiest to tie a nice knot to, and that's why I personally prefer my E. Marinellas. The feel of the foulard silk is just above others and the knots they tie.. Ah. I agree with your points. With more casual looks a more random knot can be much better than a dimple. Then again, not all 'random knots' are that good looking, so a look in the mirror before walking out the door is often needed. I'd say all my shirts are with either semi-spread or a really wide spread collar, as can be seen from most of my outfit pictures (these pics lie a bit with no neck inside). However, I still don't see the beauty in a Half or Full-Windsor, unfortunately. To me it just seems clunky and uninteresting. @anon: He just said in the beginning he hates windsors. I really prefer a random form to the dimple in the middle, because I think it works great with more casual outfits. I also prefer grenadine, wool or cash ties in fw even when I am wearing a sharp suit, just to add a touch of casual. But I don't really have to wear suits, I wear them just because I want to so adding a casual element works in my office without being out of place. Yeah, that's I dress most of the time as well, hence the collection or shabby wool ties and 12 knit ties. I think it's interesting that you find grenadine ties casual, I find them on par with normal silk ties or even more formal myself. Especially in dark colors and even more if they are the smaller weave grenadine garza ties. I have 2 grenadine ties, one navy, one grey. I don't know, there is something about it's texture that to me screams sportcoat+trousres rather than worsted suit. I just love your tie collection! Gotta say, you really know how to make interesting combinations. I recognize it's not your native language and heaven knows my Finnish is non-existent, so I am not criticizing, but did want to point out it's DImple not Pimple. A dimple is a small depression some people have in their checks or in their chin. A pimple is a small bump or raised point in the skin caused by a blocked pore. The depression in the tie is thus a dimple not a pimple. Very much enjoy your blog by the way! Great blog! You've got amazing taste and style. Hehe you got me there. I really need to do some spell checking in general with my texts when I have a more relaxed week. Anyway thanks a lot and you are welcome to visit again! My Top Ten - Which One's Your Favorite?